“The light dimmed as we descended the stairs. I could feel the cool damp air on my skin. I looked around in anticipation. It was then that my eye stopped and stared. It sat looking forlorn and unloved with skin peeling in unsightly patches, cast away like a worn out slipper. Four tired companions stayed close,standing in silent loyalty. Parts hung and dangled, yet held strong in a valiant effort to maintain dignity. I sighed, as a thousand memories flashed through my mind of the time we had spent together. I made arrangements to bring this old friend home. Home to a place where it would be honored for the many magical memories it had enabled. What I brought home that day was my parent’s old kitchen table. We ate dinner at that table almost every night for as long as I can remember. This table was the nerve center of my childhood home. It was a place for communication. The mail pile always sat to the left side. It was the location for teaching, counseling, visiting, as well as eating. It was at that table that we discussed our day’s activities, made family plans, made decisions and talked out delicate situations. This table was the place where business transactions were made, homework was done, crafts were made, letters were written, books were read, celebrations and even tea parties took place. It was a favored spot to do almost any activity in the Winter, as it had a forced air heat register below it that would warm your feet. Yes, this table was the central meeting spot for the heart of my home. As I searched for a picture of this table, I became frustrated to find so many photos of the dining room table, not the kitchen table! The dining room table was used for the really big occasions and holidays. Yet, I have no fond memories of that table. I wondered why? Then as if a shade had been opened and the sunlight streamed through, I knew it wasn’t the table or the big occasions that created the fond memories. It was the little things, the daily consistency of family unity, that composed the magical memories. Like scraps of a quilt, each piece telling a story, all sewn together into one big beautiful quilt. 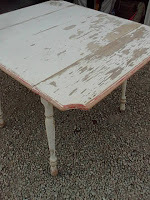 I thought again about this table for which I held such a powerful fondness. It was silly really, after all it was just a table. But, it was the memories it rekindled, and the spirit of family that it represented, that made it special. My grandfather’s hand prints are on the bottom of all four chairs. One time when he repainted the table he carried the chairs with wet hands off to dry. I wondered, …if that table could talk, or if it had kept a diary, what would it say? This table had been won by my father’s mother (my Grandma Baker) in a grocery store raffle drawing. I’m not sure what year that was. My grandparents were married in 1927. A picture was found of an unidentified family member taken in 1944 sitting on one of the chairs. We can conclude that the brand new table set arrived sometime in that time frame. My mom and dad were married in 1950 and the table and chairs went with them to set up “housekeeping.” I lived at home for 21 years and then the table joined my family in 2000. We now have the fifth generation sitting around this table making memories. It really doesn’t matter what activity you do with your children. Just do something together!